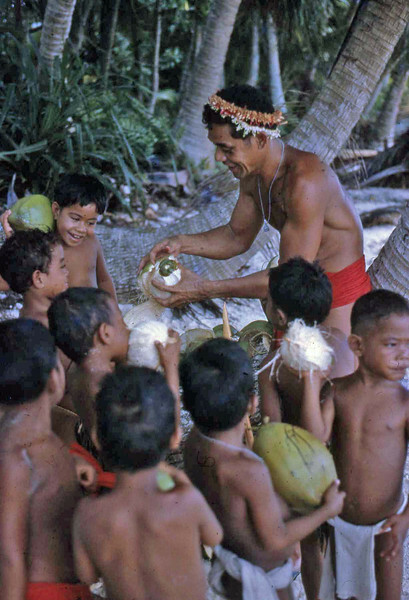 Head Start picnic on Ifalik: Mairal husking coconuts. Mairal was from Falalop, Woleai. Susan: "Once we got to the small island (forgive me, I do not remember the name) for our Head Start field trip, we had to have something to drink. This was our second field trip. The other was when a seaplane landed with four oceanographers studying the crown-of-thorns starfish. I got a chance for all the kids to tour the plane I could not get them to take us for a ride, though I did try."